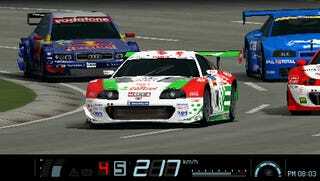 Gran Turismo For PSP Was Almost "Gran Turismo Spyder"
Polyphony Digital's "real driving simulator" Gran Turismo is finally coming to the PSP this October, some four years after it was announced as Gran Turismo 4 Mobile. But now it's just simply Gran Turismo. Why is that? We sat down with Polyphony president Kazunori Yamauchi at E3 last week to find out more about the PlayStation Portable taking on the Gran Turismo series, who told us that the game is unassumingly titled Gran Turismo for a few reasons. Yamauchi noted multiple times that the game is partly focused on new Gran Turismo players, the type of gamer who might be more hesitant to dive in to a 10-year-old series that's already four iterations in. He said that Polyphony Digital is hoping new players will be able to experience the thrill of learning how to drive, Gran Turismo style. The car enthusiast also said that he'd considered naming the game Gran Turismo Portable or Gran Turismo Spyder, but didn't want to give the impression that the PSP entry was anything less than a "fully-specced Gran Turismo." Shame, really. Gran Turismo Spyder is a pretty cool name. And Sony's already got rights to use spidery fonts. We'll have more from our one-on-one interview with Kazunori Yamauchi tomorrow.